June has come and gone. It was a great month in sunny Vancouver (and some in Victoria and some in Seattle too). I found myself with time to explore this new city, sit at the beach and the parks, and visits to the cities above—both for the first time. As for my goals, there was mixed success (again), though I’d classify it as “mostly successful”. I used some strategies from previous months and learned some new lessons (and the old lesson of being more specific in how I phrase the goals). I’ll be taking July off from the monthly goals for a mid-year assessment period, so these will be the last of the first set of goals. The whole experience has been great and I’ll talk in my analysis about some larger lessons learned. This was a habit I’d been wanting to develop for some time now. Flossing is that perfect example of something I know is good for me—that I should be doing on a daily basis—but that had never been habitualized before. This goal was rather easy to complete. I used the technique of tying this to something that was already a habit—brushing my teeth. Luckily, these already went together. I simply wouldn’t pick up my toothbrush until I had already flossed. I found that after a floss and a brush, my teeth felt cleaner than usual. This was fairly obvious as a hypothesis but a pleasantly reaffirming consequence. I hope to keep this one going—but certainly a success from June! In May, I began formulating an idea of writing an ebook. The basic idea was collecting what I had learned from traveling around for the last 4 years while sustaining employment. I did some quick research and saw there really wasn’t much out there on this specific niche—and with the opportunity to self-publish being so easy these days (through Amazon’s portal for ebooks), I thought it’d be a fun project. I started drawing up some notes and approached this month with the writing goal to get a first draft going. As of now, I’ve written over 15,000 words (approx. 50 pages). I have a complete outline and every section has at least some content. Some sections are fully thought-out and developed, others exist in outline or note form. There are lots of notes on things needed. So, certainly, there’s a lot more to do, but the foundation (“first draft”) is set. And I’m getting more excited about the project each day (a good sign). Here’s a recurring lesson: goals can be both achieved and failed. This one is an example. The goal here was to lose 8 pounds. I weighed myself on June 1st in at 172.2 pounds. On June 20th, I weighed myself at 164 pounds (after a morning workout and not having eaten breakfast). So, goal achieved! And, yet, by the month’s end, I had gained some of that weight back (thanks to a few days of drinking and not having my kitchen to make my meals). So I ended the month at 165.8—a failure on my goal. So did I achieve it or not? Well that depends on interpretation on what a goal means? 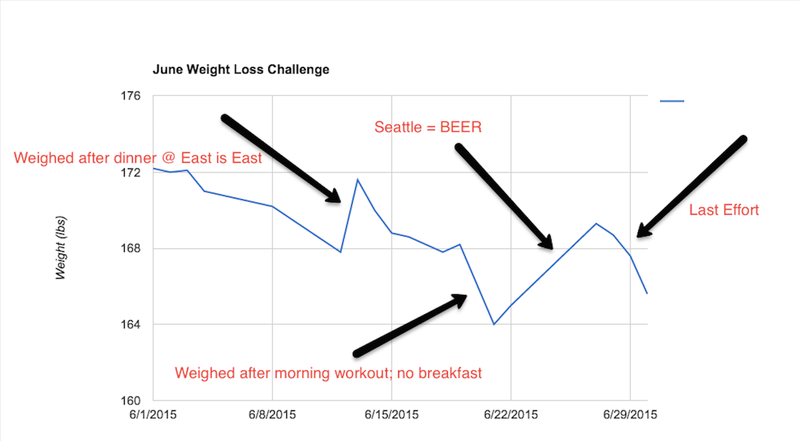 I did lose the 8 pounds, but it was not “lost” by month’s end. An interesting perspective challenge! The real element here is the learning: one in how to cut weight (mostly with nutrient timing and more working out), AND the effect of environment on that. With a kitchen to cook and control meals, weight loss was relatively smooth (see the general trend in the first half of the graph). Once removed from that, it becomes a lot more difficult. For now, I’ll have to consider this goal as “failed” (how I interepretted it). Thought there is some mixing in of success at having—at one point—lost those 8 pounds. Another month and some habits tried and formed. I saw the second success of the strategy of tying one habit to another (already formed) habit. This will be something I take with me as I go forward. The weight loss plan didn’t quite pan out—but there were certainly some success aspects to pull out of there. I learned a lot about nutrient timing and how diet and exercise interact with one another. I did lose a good sum of weight, but ultimately was unsuccessful because I was unprepared for a new environment. For the first few weeks of the month, I was at home and within walking distance of a gym. I walked a lot, worked out more, and ate exactly what I wanted to eat and when. As I left Vancouver, I sacrificed a great deal of control over my environment. Of course, I anticipated this since this comes with travel—which I do quite often. One aspect of travel is an increase in environmental instability. You don’t get to control the happenings around you and the access level you have to certain accessories (think: groceries, gym, kitchen—just to name a few). In Victoria & Seattle, I found myself eating every meal at a restaurant. I had limited access to a workout facility (though I was able to cheat the system a bit in Vic), and the days were not as open for my own planning (trains, boats, check-out times). I do think it’s possible to keep habits up while traveling, albeit much more challenging. One needs a certain level of not only disciple, but patience and persistence to make these happen. My first months of 2015 proved that, but I’ve yet to be successful on each of my three goals in any month. What part of that is due to a environmental flux and what is due to my own lack of systemization? That, dear readers, is the question to figure out through July—a month off of goals and dedicated to an assessment of what’s happened already and what I can do to be more successful ahead.